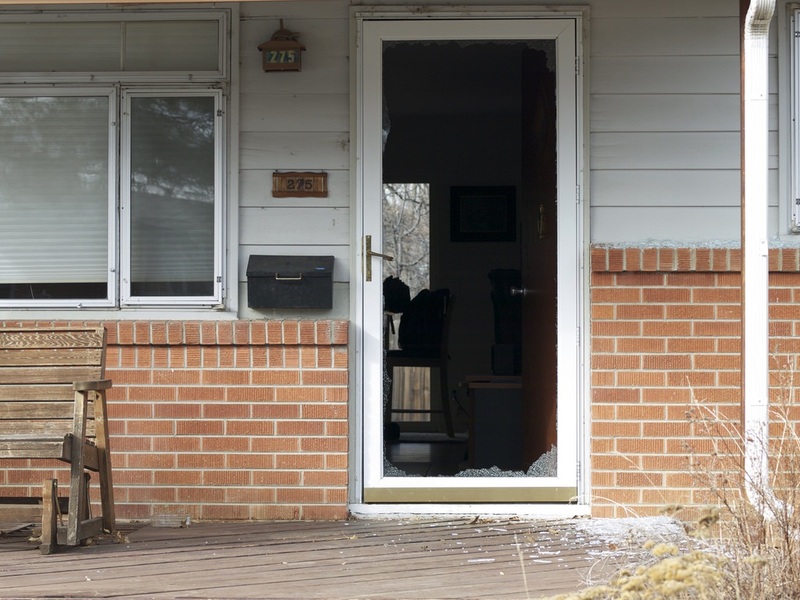 How to Install Storm Door Closer — Install a storm door closer in four easy steps. This article covers the installation of a storm door closer in the most common configuration. Proper adjustment is also important to keep the door closing smoothly and gently and so is setting the closer for summer screen doors or winter storm doors. 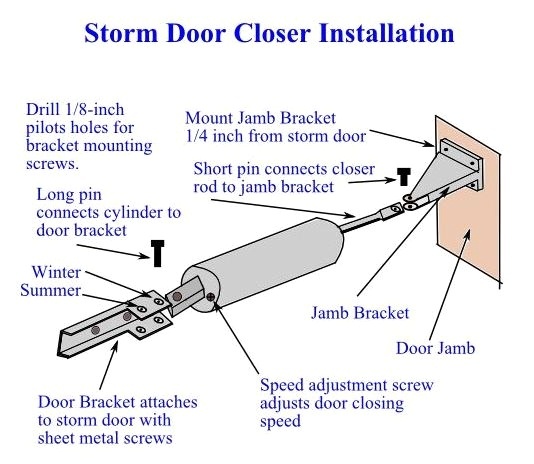 Storm door closer installation including adjustment for both winter and summer use. Learn how to install a storm door closer for use with storm doors and screen doors. Attach the jamb bracket first, then the door closer rod. Connect the cylinder to the door bracket and attach the door bracket to the door. Adjust the screw in for less speed and out for more speed. Move the pin from the summer and winter positions to change the door from screen to storm function. Years ago, someone got the idea to attach a spring between a door and door jamb and invented the storm door closer. But it didn’t always work and too often the door would simply slam closed, possibly resulting in broken glass. Enter the pneumatic door closer. The pneumatic door closer still operates off a spring but a cushion of air causes the door to close smoothly. Install a storm door closer to close your storm and screen door gently. Be sure to read the manufacturers instructions since installation for different models may vary. The jamb bracket attaches the storm door closer to the door jamb. Close the storm door and measure in 1/4 inch from the door on the jamb the storm door hinges attach to. Mark the jamb near the top and 1/4 inch from the storm door. Hold the jamb bracket in position and mark the screw hole centers with a pencil. Drill 1/8-inch pilot holes for the screws. Place the bracket against the door jamb again and screw it to the hinge jamb using the supplied screws and a Philips screwdriver. Place the hold-open washer onto the rod that extends from the door closer cylinder. The best part of the washer should point towards the cylinder. Place the flat part of the rod into the jamb bracket and hold it so hole in the rod aligns with the holes in the jamb bracket. Insert the pin into the hole in the top of the jamb bracket, through the hole in the rod and out the bottom hole of the jamb bracket. Pull the cylinder away from the jamb bracket until the two small bumps on the rod are outside the tube. Slide the closer washer over the bumps and up against the cylinder. This will hold the rod and cylinder in the correct position for attaching the door bracket on the storm door and put the right amount of tension on the internal spring. Place the door bracket over the hole on the end of the cylinder. The hole closest to the end of the bracket is the “winter” hole. Insert the length of the door closer pins through the door bracket winter hole and closer cylinder hole. Close the storm door and latch it. Hold the door bracket against the storm door with the closer cylinder and rod level. Mark the screw holes on the storm door. Open the storm door. Carefully drill two 1/8-inch pilot holes in the storm door for the door bracket. The metal on the door is usually quite soft and drills easily. Run the drill at a slow speed and take your time. It is very easy to drill completely through the door and you do not want to that. Close the door again and attach the door bracket to the storm door with the supplied screws. Adjust the speed of the closing door by turning the adjustment screw at the end of the door closer. Turning the screw clockwise will slow the door and counterclockwise will speed it up. The door should swing closed, come nearly to stop a few inches from being closed, then finish closing gently. A screen door requires less force to close than a storm door. Hold the door open a bit, lift the pin out of the door bracket “winter” hole, move the cylinder to the “summer” hole (furthest from the cylinder) and reinsert the pin. When fall arrives, just move the pin back to the “winter” hole to close the door with the glass panels in place.